Flowers are probably the most obvious choice to fill your jam jars with but jars are so versatile. They provide endless opportunities for giving thrifty but appealing gifts, crafting stylish decorations and of course, making practical yet lovely storage. Jam jars come in all shapes and sizes, some with easier to peel labels than others, that’s true (pssst… the Streamline label has a special glue which makes it really easy to peel off). So don’t put your empty jars in the recycling bin just yet! We’ve put together a few smart ideas so you can upcycle your jam jars and give them a whole new lease of life! Gather bits and pieces to put together a sewing kit and make the lid a pin cushion. This is such a personal and gorgeous gift to receive. Layer cake ingredients inside a jar and attach a handmade tag with all the recipe instructions. And invite yourself back for a tasting session! Make glow in the dark jars by simply painting them with glow-in-the-dark paint which you can find in craft shops. 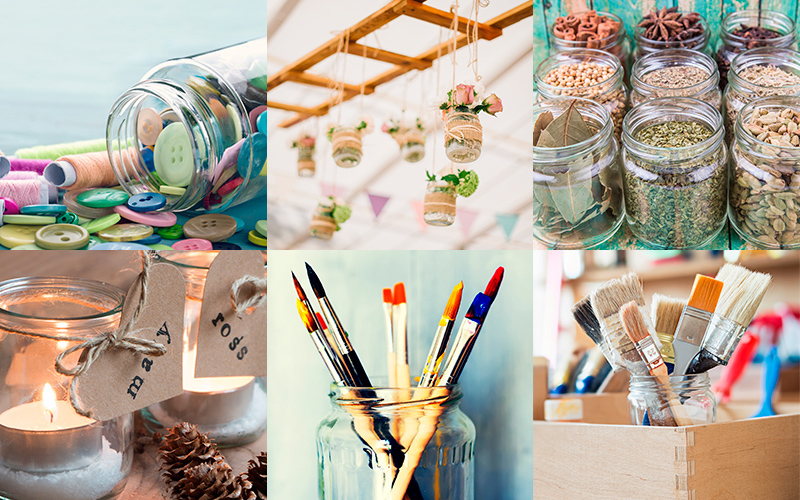 Whether it is to add a bit of fun to a child’s room or line up along your garden path, these quirky jars will be a real talking point! Make eye-catching candle holders. Tea lights create a lovely soft glow in a jam jar but why not place a long tapered candle in a jar filled with coloured sand, sea salt or small pebbles and enjoy a simple yet stunning centrepiece. Display your cut flowers. There’s nothing prettier than cut flowers in a jam jar. Personalise them with just a few pieces of lace or ribbon tied around each jar, whatever takes your fancy! Line up three jam jars full of your favourite posies for a lovely windowsill display. Make a Christmas snow globe. A jar, some glitter and fake snow, plastic Christmas ornaments and some glue. Easy. Glue the ornaments to the back of the lid, fill with snow and glitter then screw on! You can make this also with water and add a few drops of glycerine or baby oil – this helps the ‘snow’ to fall gently rather than just sink. Do make sure your props inside are waterproof and consider gluing the lid to the jar to prevent any leaks. Add natural fragrance to your home. The Yummy Life has a great tutorial on how to make natural room scents in jars such as Orange, cinnamon & cloves, perfect for Christmas! And they look pretty special, too. Learn how to make these wonderful home fragrances here. Use jam jars as quirky and fun drinking glasses – perfect for a spring or summer garden party! Jazz up your ice creams. Put a few scoops of ice cream or sorbet in jars (you can even do this ahead and leave them in the freezer until needed). When ready to serve, simply add your favourite topping or retro cocktail umbrellas. Or try Streamline’s recipe for Blackcurrant iced mousse. A fresh way to serve your favourite frosty treat! Make your own take away brekkie! You can make these Raspberry breakfast yogurts ahead and take to work for a healthy start to the day. Keep your screws and nails organised by storing them in jam jars. You could even fix the top of the lids to your garage shelves to save space. Store your herbs, spices, grains, legumes, nuts & seeds. If you have lots of packets in your cupboard, simply decant them into a jam jar like Simple Bites has here. Gather utensils, pens, pencils, paint brushes and more ! Jam jars are so useful for storing things together. Pop your kitchen utensils, cutlery, brushes… in a jar to keep them in one place. Store your buttons. Where are all those little packets of spare buttons that come with new pieces of buttoned clothing when you need them!? Put them all in one jar so you know where they are in case of a button emergency. Grow your own herb pots. These will look lovely sitting on your kitchen windowsill too. Check out the Trimcraft blog to learn how to make your own herb pots. Think of jam jars as empty vessels of creativity! Enjoy upcycling. The possibilities are endless! http://thenaturalweddingcompany.co.uk/blog/tag/jam-jars/ The Natural Wedding Company is a resource for planning a natural, eco-friendly wedding and their blog is brimming with gorgeous ideas on how to re-use jam jars at a wedding. http://www.trimcraft.co.uk/articles/3-ways-to-upcycled-jam-jars-including-sewing-storage-photo-frames-herb-pots Trimcraft is a supplier of craft paper, tools & accessories and anything you might need for your craft project.